Professional Speaker. Author. International Entrepreneur. Adversity Conqueror. Inspiration and…Rock Drummer! Graham is Patron of The Stag Theatre and Community Arts Centre in Sevenoaks, UK. Out of the Bottle is published in Estonia. Read the amazing story sent from Estonia and see Graham being interviewed on Tallin TV. 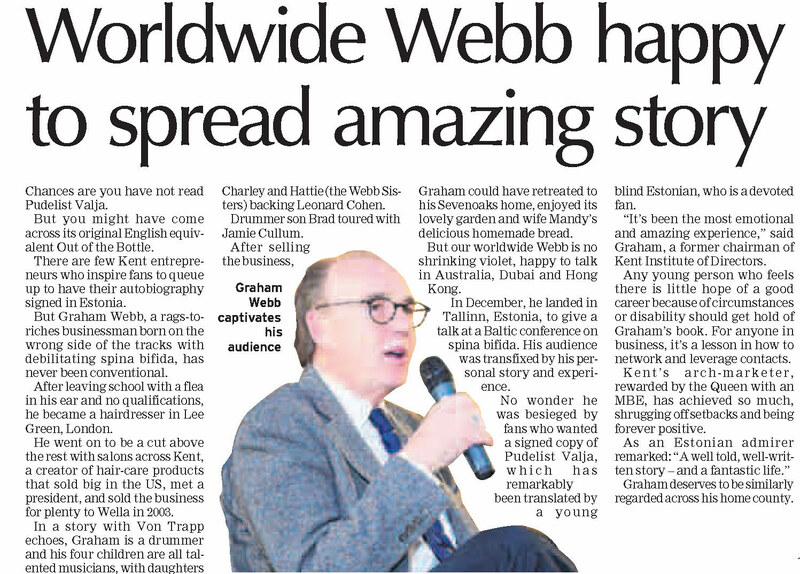 Graham Webb is an internationally recognised entrepreneur. An outstanding salesman with an unparalleled hunger and drive. Traits that made him a success inside and outside the boardroom. He built a business empire that sold when reaching number 4 in the US market. He had it all: money, success, family. But it hadn’t always been that way. Has to be seen to be believed, you couldn’t write Graham’s story. Book him now! You see, Graham’s isn’t a story of the silver spoon. No, in an age where celebrity is idolised and fame is sought above all else, Graham’s journey of grit and determination shines through like a beacon in the night. An example to us all. His battle with adversity, and eventual triumph against insurmountable odds, is a story that is both inspiring and emotional. It will leave you empowered, eager to make that change you have always wished for, and ready to go after the dreams you let slip away. As Graham rightly puts it: it CAN be done! Today Graham tours the world delivering his unique success story to standing ovations. Recounting his entrepreneurial and personal journey he gives you tips and anecdotes that you can take away and use to inspire your own life. All laced with his unique sense of humour and perspective. Covering the ups, most definitely the downs, and more importantly: how he overcame them. Graham’s motivational speeches are ideal for business conferences, networking events, students and seminars. Still not sure if you’re ready to book Graham to speak at your next event? Visit the Speeches page for more information and recent testimonials. Graham’s autobiography, Out Of The Bottle, is littered with tales of unpredictable encounters, entrepreneurial insights, humorous anecdotes and startling coincidences. It has received countless praise from peers, celebrities and readers across the globe. An open and honest reflection of his life, his story is empowering and inspiring to all. Charting his rise from humble beginnings as a school boy written off by his peers. To building a business empire and chasing a personal dream to play as a professional drummer. Out Of The Bottle is an inspirational piece of writing that touches the human soul on every level. To get your signed edition and read some of the rapturous reviews click here. In this 4 minute video hear some of what Graham has to say and see some of the reactions.